2 weeks to go until installation of the Camas project in Halsey. Tonight, I managed to work all 10 “flower buds” onto a length of rebar. Not too impressive, but with the hand injury it was monumental! We will see what my hand thinks of it later on. Today was spent primarily in Eugene working on family issues, which means basically no art. Oh well! Tomorrow my official “Igor” comes to help! Igor, also known as my good friend and crazy art buddy Suzanne, has agreed to assist with creating buds and petals. I still need flower petals, stamens, and pistols for a bunch stalks. 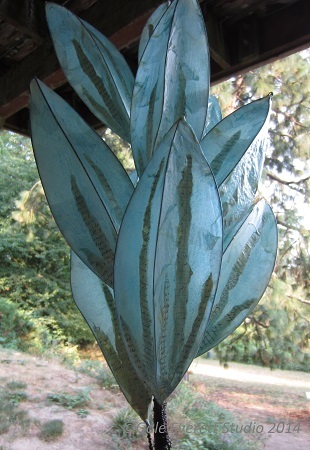 I’ll work on gold leafing parts for the purple dictionary stalk (camas #4) and covering forms she creates. The project is still lacking a grass seed connection and more books! We will see what emerges with the assistance. Yay for crazy buddies! Take care and good thoughts for the home stretch. Thanks Karen! It will certainly be a lively day! We should do a tour of all 3 sites and hit a winery or two along the way. of color and materials, all create excitement to see the final installation. ( I really love the aqua color on the latest version). Thank you so much for sharing, via your blog, your process, your thoughts, etc. Awh shucks Katheryn. I’m so touched by your comment. Thank you for chiming in with your beautiful words. I really appreciate them. These are looking wonderful. I love the torn journal strip.